Will you be affected by the A1 closures in Gateshead? Traffic update: The A693 in County Durham is closed both ways, with slow traffic between A692 and A6076 / B6168 Shieldrow Lane due to an accident. 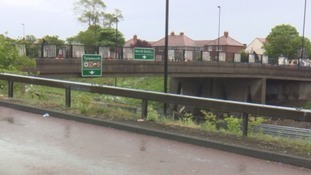 Construction work on a replacement bridge over the Coast Road on North Tyneside has been delayed because of last night's weather. Rail services through Berwick are subject to delays and cancellation this morning due to signal problems in the area. A fault with the signalling system between Alnmouth and Berwick meant all lines were blocked earlier this morning. Services are suspended on Northern between Chathill and Morpeth. A good service is expected to resume by 8am. National Rail has announced there will be no trains between Hexham and Carlisle for the rest of the day due to a signalling problem. Replacement bus services are in place. TRAVEL TIME: A167/A167(M) Southbound from #Cowgate to Tyne Bridge #Gateshead (3.4 miles) is now 8 mins.